"Attention! Increase speed beyond all reason." Steve Oedekerk's Thumbation technique, whereby thumbs become actors, complete with faces, has been hit or miss on the last two releases. 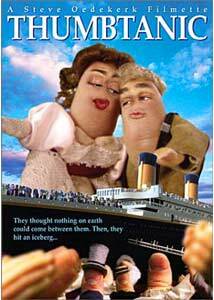 Thumb Wars was a clever rip on the Star Wars mythos, while The Blair Thumb was painfully unfunny; while not as smartly written as Thumb Wars, Thumbtanic does have plenty of cheap laughs and goofy sight gags. It might seem odd to watch a comedic spin on an event that killed over 1,200 people, but it should be pointed out that Oedekerk has really designed this to be more of a parody of James Cameron's bloated timewaster than a history lesson. The story is a drastically condensed version of Cameron's film, and it is about Jake (Steve Oedekerk), the poor passenger, who falls in love with wealthy Geranium (Mary Jo Keenen). The doomed liner naturally hits an iceberg, which prompts some high comedy and lowbrow visual jokes from Oedekerk and crew. Oedekerk focuses on lambasting some of the well known scenes in Titanic, including the "I'm the king of the world!" scene, while other thumbs wait behind him, practicing such lines as "I'm a bedwetter!" "I'm a dentist!" and "I'm cleaning my oven!" Silly, yes, but I laughed. Early on, when Jake wins his passage on Thumbtanic, he does so by winning a thumb war contest. Yeah, I laughed at that, too. The Thumbation process works well here, and the production values are solid. The characters look surprisingly distinct, and some are downright bizarre (check out the weirdly bearded Captain). This is funny stuff, and worth a rental. Image Transfer Review: Image has come through with a super clean 1.33:1 image transfer on Thumbtanic. As with the other Oedekerk Thumbation titles, colors here are bright, and detail is excellent. Source print looks to be near pristine, with really no blemishes or imperfections to speak of. Audio Transfer Review: Just like the other titles in the Thumbation library, this disc includes a pair of solid audio tracks, in Dolby Digital 5.1 and 2.0 surround. The 5.1 track is very full, and a few of the rear channel effects are more robust than is some full-length discs I've watched lately (check out the dive sequence of the Thumbtanic wreckage). Dialogue is clean and clear throughout. Extras Review: The full-length, scene-specific commentary from Oedekerk, producer Paul Marshall, art director Jorg Dubin and effects supervisor Dave Merrell is lightweight stuff, but it's short enough to merit a sit through without too much squirming. No deep technical insight, but the guys yuck it up pretty heavily while discussing the project. Oedekerk points out an inserted scene lifted from the opening of Thumb Wars, and there is some brief talk about the difficulty in creating the more detailed effects shots featuring many thumb characters. A handful of storyboards and trailers (Thumbtanic, The Blair Thumb, Frankenthumb and Bat Thumb) are also included. From the trailers, Frankenthumb looks to be the funniest. This is silly entertainment. Oedekerk wisely keeps the runtime short, and by doing so avoids the thumb concept becoming too annoying. Hmm, maybe Cameron should have thought of that. This particular installment has some funny dialogue, and lampoons Cameron's big budget epic handsomely.